Stewart Swedrlow's great-uncle, Yakov Sverdlov, was the first president of the Soviet Union, and his grandfather helped form the Communist Party in the United States in the 1930s. To ensure that his loyalties stayed with the US government, he was "recruited" for specific government mind-control experiments which enhanced his natural abilities. He spent years in service to various US and foreign government agencies and special interest groups. His mind and body were used for genetic and mind-control experiments which led to severe illness, broken relationships, and premature Kundalini activation. After several years of deep self-analysis, Stewart merged with higher levels of his multidimensional self, which saved his life. His mission is to help others heal themselves in a positive way, thus avoiding the negativity he experienced. For the first hour of this program we discuss, the Montauk Project and mind control, as well as themes from his book, "13 Cubed - Case Studies in Mind-Control & Programming". 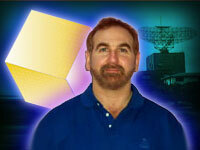 For our subscribers, we continue the discussion about Illuminati & the alien/reptilian agenda. We cover topics such as Star Trek & Hollywood programming, fake/real alien threats, the reptiles and government alien disclosure.